Jason Kennedy netted a goal but received a red card in Rochdale's first win of the season against Brentford. Kennedy fired home the decisive third but his celebrations with the away fans earned him a second yellow card. Anthony Elding had earlier headed Dale into the lead after pouncing on Andrew Tutte's parried long-range shot. Robbie Simpson then levelled with a neat finish from Myles Weston's cross, before Chris O'Grady restored the lead for Rochdale from the edge of the box. "I'm really disappointed, we are giving away ridiculous goals at the moment and it's not good enough. "When you've only got one point, you've got to consider changes." "We'll be looking at everyone and see how we can make it different." "The main thing is the three points but obviously from my point of view I was delighted with my first goal for the club, then obviously straight after the disappointment of getting sent off which personally the emotions got the better of me. "The ref's got to abide by the law, players when they score they want to celebrate with the fans and the rest of the players and there should be like a bit more leniency towards that I think." "There's big clubs in this league, we're always going to be classed as the underdogs so it was good to get off the mark." 94:08 The ref blows the whistle to begin the match. 94:08 The match has reached full-time. 90:00+3:30 Charlie MacDonald takes a shot. Save by Josh Lillis. 90:00+1:40 Headed effort from inside the penalty area by Carl Cort misses to the right of the target. 89:02 Free kick awarded for a foul by Chris O'Grady on Karleigh Osborne. Free kick taken by Alex McCarthy. 88:00 Carl Cort has a headed effort from close in and clears the bar. 86:49 Myles Weston takes a shot. Josh Lillis makes a save. 84:55 Brian Barry-Murphy decides to take a short corner. 84:06 Brian Barry-Murphy decides to take a short corner. 82:59 Inswinging corner taken by Nicky Adams, Headed effort on goal by Toumani Diagouraga from inside the penalty box misses to the right of the goal. 82:21 Robbie Simpson takes a shot. Josh Lillis makes a save. 81:36 Substitution (Rochdale) makes a substitution, with Jean-Louis Akpa Akpro coming on for Anthony Elding. 81:22 Chris O'Grady is flagged offside by the assistant referee. Alex McCarthy takes the free kick. 81:00 Karleigh Osborne gives away a free kick for an unfair challenge on Chris O'Grady. Brian Barry-Murphy takes the indirect free kick. 78:26 Shot by Toumani Diagouraga from outside the box goes high over the crossbar. 77:12 Chris O'Grady has an effort at goal from outside the box which misses left. 76:35 Brian Barry-Murphy takes a inswinging corner from the right by-line to the near post, Leon Legge manages to make a clearance. 70:42 Charlie MacDonald takes a shot. Save by Josh Lillis. 70:04 Substitution Marcus Bean goes off and Carl Cort comes on. 68:09 Myles Weston fouled by Craig Dawson, the ref awards a free kick. Nicky Adams restarts play with the free kick. 65:02 Craig Woodman takes a inswinging corner. 63:38 Free kick taken by Alex McCarthy. 63:38 Substitution Gary Alexander leaves the field to be replaced by Nicky Adams. 63:38 The assistant referee flags for offside against Chris O'Grady. 61:36 Sent off Jason Kennedy sent off. 61:10 Andrew Tutte provided the assist for the goal. 61:10 GOAL - Jason Kennedy:Brentford 1 - 3 Rochdale Goal scored by Jason Kennedy from close in to the bottom right corner of the goal. Brentford 1-3 Rochdale. 59:03 The assist for the goal came from Joe Widdowson. 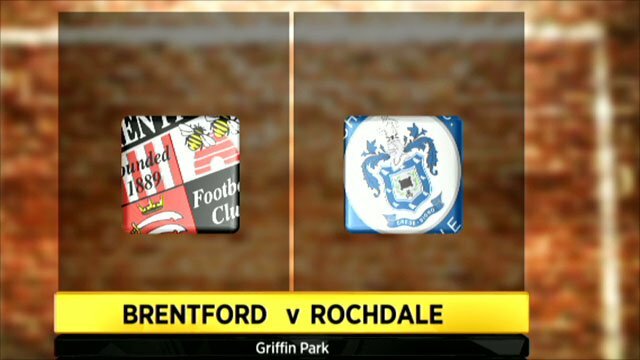 59:03 GOAL - Chris O'Grady:Brentford 1 - 2 Rochdale Chris O'Grady grabs a goal from inside the box to the bottom right corner of the goal. Brentford 1-2 Rochdale. 55:29 Jason Kennedy is caught offside. Free kick taken by Alex McCarthy. 54:10 Effort on goal by Gary Jones from deep inside the penalty area misses to the right of the goal. 51:14 Inswinging corner taken by Kevin O'Connor, Brian Barry-Murphy manages to make a clearance. 50:11 Shot on goal comes in from Robbie Simpson from the free kick, Anthony Elding gets a block in. 50:11 Booking Marcus Holness is cautioned. 49:44 Marcus Holness gives away a free kick for an unfair challenge on Toumani Diagouraga. 48:33 Marcus Bean concedes a free kick for a foul on Andrew Tutte. Free kick taken by Gary Jones. 45:11 Joe Widdowson challenges Robbie Simpson unfairly and gives away a free kick. Free kick crossed by Craig Woodman. 45:00 The half-time whistle blows. 43:13 Inswinging corner taken from the left by-line by Kevin O'Connor, Header by Robbie Simpson from deep inside the penalty area misses to the right of the target. 42:16 Free kick awarded for a foul by Robbie Simpson on Joe Widdowson. Free kick taken by Josh Lillis. 40:39 Effort on goal by Gary Jones from outside the penalty box goes harmlessly over the bar. 36:29 Corner taken by Craig Woodman from the right by-line, clearance by Brian Barry-Murphy. 32:49 The offside flag is raised against Charlie MacDonald. Free kick taken by Josh Lillis. 32:16 Foul by Craig Dawson on Marcus Bean, free kick awarded. Marcus Bean restarts play with the free kick. 31:17 The assistant referee signals for offside against Myles Weston. Indirect free kick taken by Craig Dawson. Correction - 30:20 Free kick awarded for an unfair challenge on Myles Weston by Anthony Elding. Kevin O'Connor crosses the ball in from the free kick, save made by Josh Lillis. 30:20 Anthony Elding gives away a free kick for an unfair challenge on Myles Weston. The free kick is swung in right-footed by Kevin O'Connor. 29:32 Inswinging corner taken left-footed by Craig Woodman from the right by-line, clearance made by Anthony Elding. 26:56 Assist on the goal came from Myles Weston. 26:56 GOAL - Robbie Simpson:Brentford 1 - 1 Rochdale Robbie Simpson finds the back of the net with a goal from inside the box to the bottom right corner of the goal. Brentford 1-1 Rochdale. 19:54 Unfair challenge on Brian Barry-Murphy by Charlie MacDonald results in a free kick. Indirect free kick taken by Josh Lillis. 18:52 Kevin O'Connor has a header from deep inside the six-yard box and clears the crossbar. 18:31 Corner from left by-line taken by Kevin O'Connor. 17:51 Corner taken by Kevin O'Connor played to the near post, Anthony Elding makes a clearance. 17:27 The free kick is delivered right-footed by Kevin O'Connor from left wing. 17:27 Booking Jason Kennedy receives a yellow card for unsporting behaviour. 17:08 Free kick awarded for an unfair challenge on Myles Weston by Jason Kennedy. 11:52 The assistant referee signals for offside against Chris O'Grady. Alex McCarthy takes the free kick. 10:28 Assist on the goal came from Andrew Tutte. 10:28 GOAL - Anthony Elding:Brentford 0 - 1 Rochdale Anthony Elding grabs a headed goal from inside the area. Brentford 0-1 Rochdale. 10:00 Andrew Tutte takes a shot. Save made by Alex McCarthy. 6:36 Effort on goal by Myles Weston from deep inside the penalty area misses to the right of the goal. 5:20 Kevin O'Connor takes the inswinging corner, Robbie Simpson takes a shot. Save by Josh Lillis. 4:38 Outswinging corner taken left-footed by Brian Barry-Murphy from the left by-line. 3:41 Chris O'Grady is ruled offside. Alex McCarthy restarts play with the free kick. 0:42 Chris O'Grady challenges Karleigh Osborne unfairly and gives away a free kick. Alex McCarthy takes the indirect free kick.